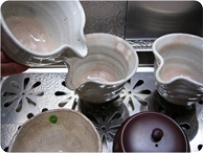 In the lessons of brewing green tea, you often learn how to make tea for several people. Because, usually, making tea is to make your guests or family comfortable. 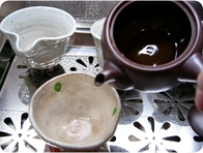 However, our tea café, “CHAI”, make tea one by one. It is very helpful to make tea for myself when you make tea for other. 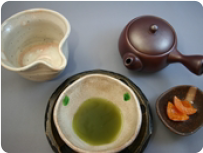 We research various ways of making tea, and recommend them for you. 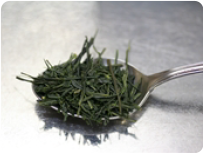 We also run a tea shop, so you can buy tea leaves by 10 grams. We support your tea life totally. 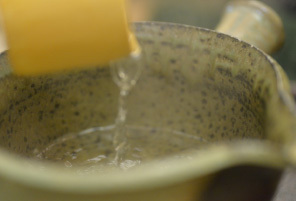 => At Japanese tea café, you can enjoy “A drip of tea”. 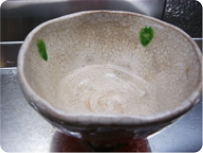 2 or 3 level of teaspoonful of tea leaves. Majoring 50 ml of water, and pour water into a teacup. Please check the amount of water in teacup. Pour 50 ml boiled water into a teacup and wait 1 min. 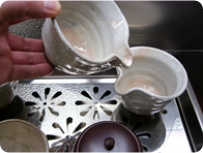 Pour the boiled water from the teacup to the1st mug. Pour hot water in the 1st mug to the 2nd mug. 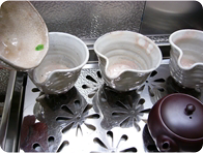 Pour the hot water in the 2nd mug to the 3rd mug. 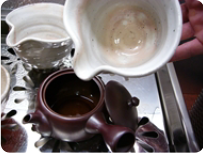 Pour hot water in the 3rd mug to teapot. Change the waiting time by tea leaves. If the tea leaves are fine, wait 40 sec. If the tea leaves are thin like needle, wait 80 sec. 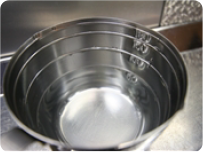 After this flaw, at the 2nd brewing, cooling boiled water is 3 times. At the 3rd brewing, it is twice. At the 4th brewing, it is once. 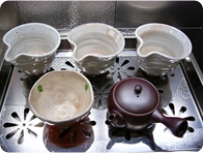 At the last brewing, pour boiled water to teapot directly.